As the name already suggest it, Basketball Star is an online video slot with an obvious basketball theme and related symbols and graphics. The game is a 5-reels slot with 3 rows and 243 ways to win and it was brought to you by Microgaming software developer. 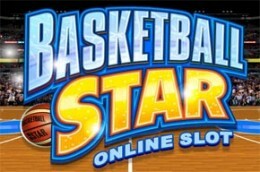 Basketball Star is playable on all devices (desktop, mobile and tablet). All the symbols are theme-related and they include a gold medal, water bottles, a tactics chart, a pair of trainers and 5 action shots of basketball players. The wild symbol is represented by the Basketball Star logo and the scatter symbol is a basketball icon.